Thinking about travelling and volunteering abroad in Nepal? How about working in an orphanage abroad? If the thought to help others has ever crossed your mind, consider volunteering in an orphanage in Nepal. Nepal is a stupendous country, full of exuberant culture and traditions, but unfortunately a streak of tragedies has left many children without homes. If you volunteer in Nepal, you will experience a new world first-hand and discover how great an impact you can make on the lives of children across the globe. Work with children living in orphanages in Nepal and help in efforts to provide love, care, compassion and education to enhance both their present and future educational and career prospects by joining this orphanage project in Nepal. Orphanages in Nepal are the only place for orphaned children to stay and get proper food, care and education. Yet, these orphanages are poorly funded and lack enough staff to take proper care of the children. When you volunteer with our orphanage project in Nepal, you will spend most of your time teaching children, playing with them, and making sure they feel loved, cared and well looked after. Through the attention you provide, the children can believe in themselves and work towards a better future. The children are also very enthusiastic about working with international volunteers. Your invaluable contribution for the betterment of the disadvantaged children will be highly appreciated. The aim of the program is to provide food, shelter and education for orphanage children. HORAC is currently looking after 33 orphans from different parts of Nepal. The orphanage is efficiently run by 11 highly committed members of HORAC’s management committee. It also has four other staff to support different activities the orphanage undertakes. Looking at the exemplary work it is doing, one can safely surmise that the orphanage truly believes in its motto, which is, “If orphaned children are kept in a homely atmosphere and showered with love and affection then they will become good citizen of the nation.” The orphanage is dedicated to helping these children achieve a bright future for them. ICYE-Nepal invites volunteers from around the world to contribute to this orphanage project in Nepal. HORAC’s office is located in a local community in Lalitpur District. To be a part of our Nepal volunteer project, you must be above 18-years-old or equivalent. You should also be reliable and show eagerness as well as be able to maintain the motivation. 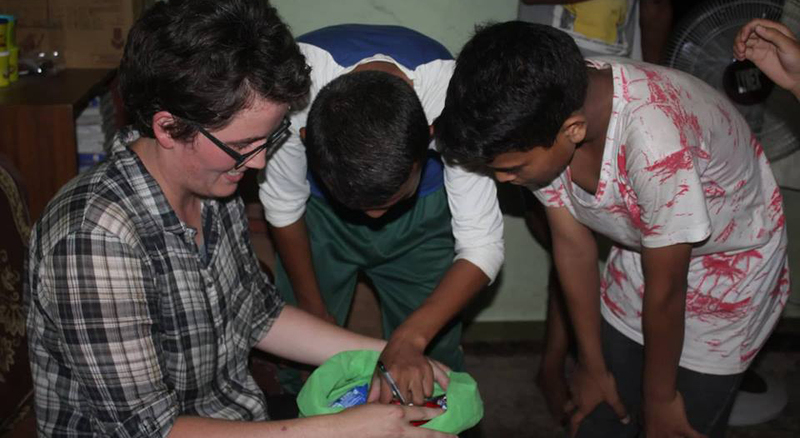 You are required to show creativity and initiative while taking part in the volunteering project abroad in Nepal. Most importantly, volunteers need to have confidence in their work, and have time and management skills to ensure an effective support. Note: Outdoor extra activities must be funded by volunteers. Maximum three volunteers can work in our orphanage volunteer project in Nepal. Volunteers need to consult with the hosting organization in advance to find out if the project is still available. Participant volunteers in our Nepal program will stay in a residential area. Generally, you will share a room with the volunteers of same gender. Single rooms are available; however it depends on the number of participant volunteers. Please be reminded that in most situations, volunteers of different gender are not allowed to stay in a same room unless they are a married couple. Lunch & dinner are provided by the local host family. Food is prepared in local style. The main types of food during your volunteer work in Nepal will be rice, lentil soup and vegetables, but once a week the host family will provide you meat in your lunch or dinner. For vegetarians the choice is usually limited to rice, vegetables, lentil soup and pickle. Helping orphans, vulnerable, helpless, poor and the so-called Dalits. HOPAD (Helpless, Orphan, Poor, Affected, and Dalits) Child & Women Promotion Society plays an instrumental role as an agent of social change to empower Nepalese women and children. By providing a quality education, good health, a loving family environment, and sustainable training programs, HOPAD increases the capacity to succeed among Nepalese women and children and ensures a prosperous future. HOPAD Child & Women Promotion Society is a non-profit, nongovernmental organization (NGO) dedicated to the cause of aiding helpless children and women. It was established in 2005 by a consortium of human rights activists, social workers, and lawyers whose greatest passion is ensuring care for those in need. HOPAD strives to ensure that the children and women in need receive the care, opportunities, and training to succeed. It is also devoted to making the government aware of the conditions in which the needy are living and making adjustments to ensure these conditions are changed. HOPAD Child and Women Promotion Society is located in a local Nepalese community in Lalitpur District. It takes 45 min by car to reach there. Volunteers participating in our Nepal program must be at least 18 years old, should be reliable and show eagerness as well as be able to maintain their motivation. Volunteers are required to show creativity and initiative while taking part in the project. Most importantly, volunteers need to have confidence in their work, and have time and management skills to ensure an effective support. Note: Outdoor extra activities must be funded by volunteers themselves. Maximum two volunteers can work in this HOPAD volunteer project in Nepal. Please consult with the hosting organization in advance to see if the project is still available. Volunteers will stay in a residential area, sharing rooms with volunteers of other nationalities participating in the same Nepal volunteer program. Lunch & dinner is provided by the local host family during your volunteer work in Nepal. Food is prepared in local style. The main cuisines will be rice, lentil soup and vegetables. Once a week, the host family will provide you meat in your lunch or dinner. For vegetarians the choice is usually limited to rice, vegetables, lentil soup and pickle. Helping and giving proper care to orphans and financially disadvantage children. The aim of the orphanage volunteer program in Nepal is to provide food, shelter and education to orphans and disadvantaged children. Light for Nepal was established in May 2005 in Kathmandu with an aim of offering free education, food and shelter to orphans and disadvantaged children. Some of their parents have died due to illness/disease and some have unstable incomes, frequently move between different jobs and often move house, rendering them unable to care for their children. Currently, some 17 children from 3 years to 15 years of age have found refuge at Light for Nepal. Light for Nepal is located in a local community in Kathmandu District. Drive by cab takes about 45 minutes to reach there. Volunteers must be at least 18 years old, should be reliable and show eagerness as well as be able to maintain their motivation. Participant volunteers in Nepal project should also show creativity and initiative while taking part in the project. Most importantly, volunteers need to have confidence in their work, and have time and management skills to ensure an effective support. Maximum 2 volunteers can work in this volunteer in Nepal in orphanage project. Volunteers need to check with the hosting organization in advance to see if the project is still available. Volunteers will stay in a residential area, sharing rooms with the volunteers of same gender. Single rooms are available. Please notify us in advance to get this facility. It also depends on the number of participant volunteers in Nepal. Please be reminded that volunteers of different gender are normally not allowed to stay in a same room unless they are a married couple. Lunch & dinner is provided by the local host family during your volunteer work in Nepal program. Food is prepared in local style. The main types of food will be rice, lentil soup and vegetables, but once a week the host family will provide you meat in your lunch or dinner. For vegetarians the choice is usually limited to rice, vegetables, lentil soup and pickle.